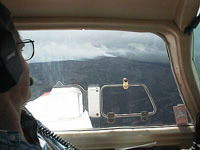 After a good night's sleep that first night in Hilo, I rented a car and drove back to the airport in the morning to arrange for another oil change, since the next one couldn't come for perhaps another 30 - 50 hours of flying time. I stopped at what I thought was an FBO (Fixed Base Operator, the aviation equivalent of a car service station). It turned out to be the local Civil Air Patrol hangar, and there was a pot luck barbeque being hosted by the Hilo chapter of EAA (Experimental Aviation Association) for a bunch of local kids involved in EAA's Young Eagles program. These wonderfully friendly folks immediately adopted me as their own, invited me to join the festivities, introduced me as an around-the-world traveler to the attendees, and in general made me feel warmly welcome in Hawaii. 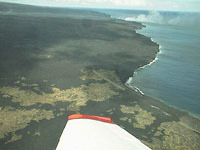 Best of all, when I asked among the group for touring suggestions for the Big Island (that's the one where Hilo is; many mainlanders don't realize that Honolulu is really not there, but rather on Oahu, a smaller island to the northwest), I was told that lava had blocked many of the best sightseeing roads, and that in any case I should see the island from the air. Before I could explain that my plane was so packed with equipment that I couldn't comfortably go sightseeing in it, I was made an offer I couldn't refuse. EAA member Eliot Merk (a local general contractor) and his stockbroker wife Elizabeth generously offered to take me up for an air tour in their own newly refurbished 1979 model Mooney 201. Although originally from California and Utah, respectively, they had lived on the island for decades and really knew their way around. 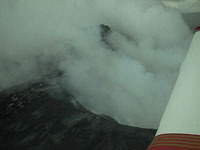 We immediately took off, and I saw some of the most breathtaking scenery imaginable. I spent two more days soaking up the tropical Hawaiian sun in Hilo before moving on. The next major flight leg would be to Apia, Western Samoa, which I expected would become the longest leg of the entire around the world trip (it was). 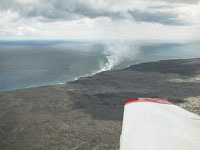 To shorten it as much as possible, on September 9th I loaded up the Mooney and took a short but scenic VFR (Visual Flight Rules) flight around the northern shore of the Big Island to Kona, Hawaii. 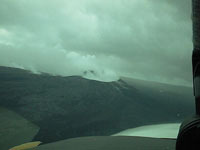 From there I would make my departure for the upcoming long trans-oceanic leg the next day. This shaved at least an hour off the expected enroute time for that trek. 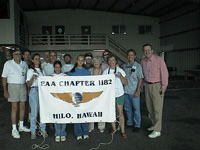 Greetings from the EAA Hilo Chapter and their newest member, me! (far right) The gentleman at the far left is nationally recognized aviation mechanic Bob Ross of Orchid Isle Aviation, who kindly changed my oil and cleaned the Mooney's spark plugs the next day. For more info about the EAA click here. 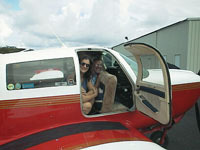 Elizabeth and Eliot Merk and their beautiful Mooney 201. 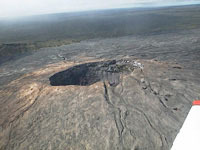 Kilauea main crater, mostly inactive now. 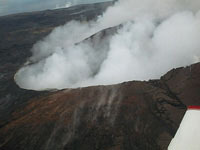 For more information on this volcano, click here. 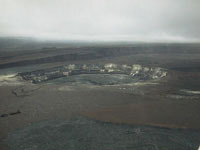 A smaller, active crater nearby. 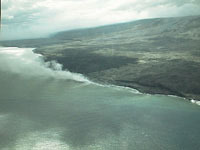 Lava flowing to the ocean, devastating a forest, covering a road, and steaming at the shore.